Nurses of the future will play a larger role in coordinating the care of patients, help lead large corporations in providing better health care options to their employees and use technology in dramatically different ways, GCU nursing students were told on Wednesday. Marla Weston (center), CEO of the American Nurses Association, was on campus Wednesday to speak at the College of Nursing and Health Care Professions. 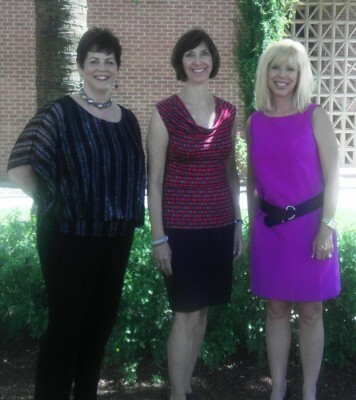 She is pictured with Dr. Anne McNamara (left), the college’s dean, and Associate Provost Kathy Player). Dr. Marla Weston, CEO of the American Nurses Association (ANA) in Washington, D.C., met with a roomful of faculty and students in the College of Nursing and Health Care Professions in advance of her keynote address today at the biennial convention of the Arizona Nurses Association. Weston, who began her nursing career in Phoenix nearly three decades ago and is a former executive director of the Arizona association, shared lessons she has learned during her career, and answered questions from students on the main campus and, via teleconference, at GCU cohort sites in Albuquerque, Phoenix, Sun City and Scottsdale. After Weston graduated from nursing school, she moved from Pennsylvania to Arizona, where she immediately had three job offers. She worked at two Valley hospitals in various nursing positions and, following her mother’s advice, took advantage of opportunities to advance. The job market for nurses, especially for those with bachelor’s degrees, remains strong, although in some parts of the country, a sluggish economy continues to impact their employment, Weston said. Fewer nurses will find jobs in hospitals as health care continues to move toward outpatient settings, she added. In the future, nurses will have more autonomy in managing their patients’ health care, but they will need to be prepared to think and solve challenges in more creative ways, she said. Just as technology has pushed forward many industries, so it will transform health care, Weston said. She predicted that treatment and diagnoses will be standardized internationally, and will require an international electronic database of health records. Nurses must adapt to that technology, she noted. As reform occurs, nurses must have a more powerful voice in the national conversation on improving health care for Americans, Weston said. To that end, the ANA is working to place nurses on the boards of directors of major corporations. On a smaller but no less important scale, individual nurses must rise above the “you’re just a nurse” stigma, and educate others that their profession is critical to the well-being of society, she said. “It’s important for you to understand the powerful impact of what you do, and to teach people about it,” Weston said.